Blackboard Ally is a revolutionary product that focuses on making digital course content more accessible. Using inclusivity, sustainability and automation as its key pillars, Blackboard Ally helps you understand and tackle accessibility in a way that benefits all students. Enhancing access to course content is a growing concern for institutions around the world as they focus on improving learning outcomes for everyone regardless of their learning needs or choices. Blackboard Ally integrates with an institution’s virtual learning environment (VLE) and automatically runs course materials through an accessibility checklist that looks for common accessibility issues. Blackboard Ally generates a range of alternative formats for the instructor’s original content including Semantic HTML, audio, ePub, electronic Braille and various translated versions. 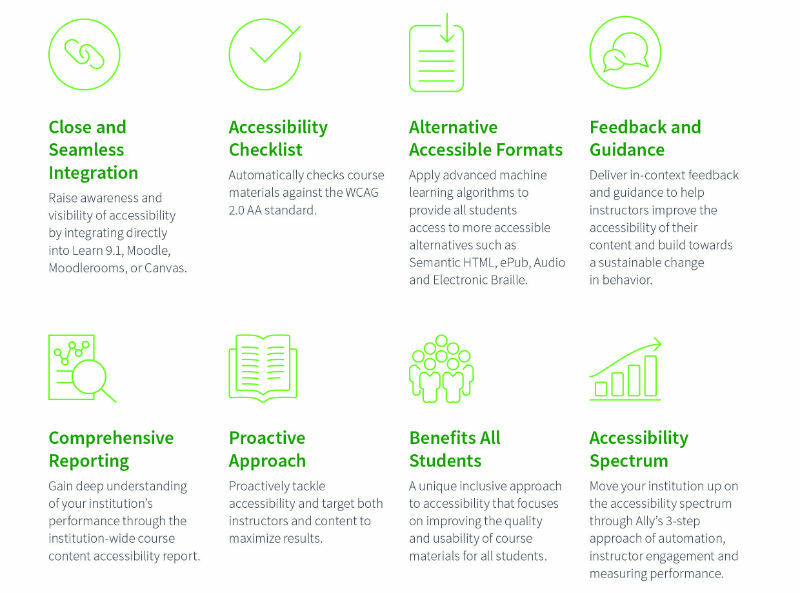 It also provides educators with guidance for improving accessibility of their course materials and reports on the current state of content accessibility at both the course and institutional level. The Bloom team at CoSector – University of London supports over 150 VLEs in educational institutions throughout the UK and worldwide, for over 12 years and strives to improve the learning experience for students. The Bloom team also offers support, consultation, application development, project work and much more to improve the working environment for academics and administrators. There are different interpretations of what a learning technologist is, essentially, they will facilitate the use of technology in learning. In our case, here in CoSector – University of London’s Bloom team, this means utilising virtual learning environments like Moodle and the suite of activities and plugins within, to make academic, educational and training content material easily navigable, engaging, accessible and multi-format for blended learning. We are committed to providing our partners in learning with the products and services to help enrich and enhance the student experience and this is a particular service we feel can greatly contribute to this purpose. Our Learning Technologists (LTs), Richard and France, are available on an ad-hoc basis or on a structured fixed day allocation for larger projects. The LTs can visit the customer site for face-to-face hands-on interaction and training or deliver remote sessions or webinars, or work directly on a remote Moodle site if they are hosted by us.